Most implanted devices available today can go through a CT scan or an MRI scanner. However, older pacemakers can present a problem for radiologists. Learn more. If you have an implanted device such as a pacemaker, heart valve, stent or implantable cardioverter defibrillator (ICD), you know it can set off the metal detector at the airport. Your device, which contains metal, is interacting with a detector that responds to metal. So if your doctor says you need an MRI or CT scan, will that create problems for you or your device? The answer to this question is not a simple yes or no — it depends on the type of device you have. Here, cardiovascular imaging expert Scott Flamm, MD, reviews what you need to know about getting medical scans when you have an implanted cardiac device. A CT (computed tomography) scan generates a cross-sectional view of your body through a series of X-ray images. If you have any device implanted in your chest or body, it’s safe for you to have a CT scan. There are no limitations, advises Dr. Flamm. Although the scan will not affect your device, if it is on the larger side, your device can sometimes affect image quality. 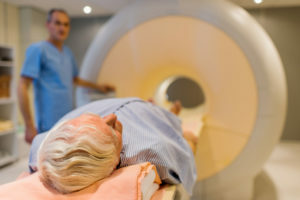 MRI (magnetic resonance imaging) uses a large, circular magnet and radio waves to produce clear computer images of the body. Most heart valves and coronary artery stents currently on the market and implanted in patients can go safely through an MRI scanner, Dr. Flamm says. More recently, however, manufacturers have developed some pacemakers and defibrillators that can be scanned with an MRI. “We don’t refer to them as ‘MRI-safe’ but instead as ‘MRI-conditional’ — we can perform MRI scans on patients with these devices, though there are limitations,” notes Dr. Flamm. If you have an older pacemaker that is not MRI-conditional, Dr. Flamm says he would not routinely recommend an MRI scan. During MRI, electricity applied to the magnet creates an alternating magnetic field. If you placed a wire within that alternating magnetic field, it could generate current and heat up. For pacemakers and defibrillators, metal “leads” that are similar to wires are implanted in the body and the heart muscle. Leads that come within the MRI scanner’s alternating magnetic field can generate electricity, or heat up, while touching your heart. Dr. Flamm says radiologists and cardiologists are creating a registry with some necessary safety protocols around doing MRI scans on patients with older devices, but it is not yet finished. “We don’t want to proceed without all of our proper safety mechanisms in place,” he says. When you get an implanted device such as a pacemaker or defibrillator, you receive a card identifying that device. It includes the manufacturer, model name and model number, a website, and a phone number to call with questions. Keep track of that card. “It’s important and helpful to have this available because that gives us all the important information we need on whether we can perform an MRI scan safely,” Dr. Flamm says. If you’re not sure which device you have and don’t have a card with this information, the steps it takes to find out more about your device can delay your MRI scan indefinitely.